Among the volumes held by Special Collections concerning British exploration of the Pacific, the book with the greatest link to the subject has nothing at all to do with it at least in terms of its topic. It is a medical text called An Introduction to Physiology (London, 1759), a compilation of lectures for students by the Scottish physiologist and instructor Malcolm Flemyng (ca. 1700–1764). The note is in the hand of William Perry, who carried the book with him when he signed on as surgeon’s mate aboard HMB Endeavour for the first of Capt. James Cook’s three Pacific voyages. Perry was later appointed to the position of surgeon upon the death of William Brougham Monkhouse on 5 November 1770, and is recorded in Cook’s journal for 7 November as being ‘equally well if not better skilled in his profession’. Title-page with Perry’s ownership inscription. 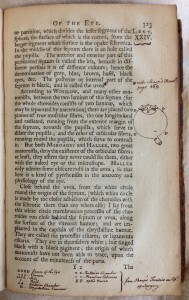 Page annotated by Perry with drawing of the human eye. Books would not have been an uncommon sight on the Endeavour. Cook had his atlases and travel narratives; Joseph Banks’s library is well attested; and some officers or literate crewmen surely had personal bibles or prayer books. While much is known about some of the titles consulted by Cook and the accompanying gentlemen scientists who sailed with the Endeavour, actual physical copies that have survived are extremely scarce. According to Matthew Fishburn of Hordern House, this scarcity is likely due to ‘hard usage, and the fact that with the probable exception of some of the grander atlases/ maps and natural history books, many of the books on board would have been quite utilitarian. It is little more than chance survival’. ‘Exceptionally scarce’ and ‘chance survival’ are apt phrases. Fishburn continued by noting that Perry’s copy of Flemyng’s Physiology is the only book from the Endeavour voyage ever sold by Hordern House in its twenty-eight year history. In fact, with the exception of John Hawkesworth’s account of the first voyage carried by Cook from Cape Town to St. Helena during the second voyage (1772–1775), the firm knows of no other books surviving from any of Cook’s voyages that have come onto the market. 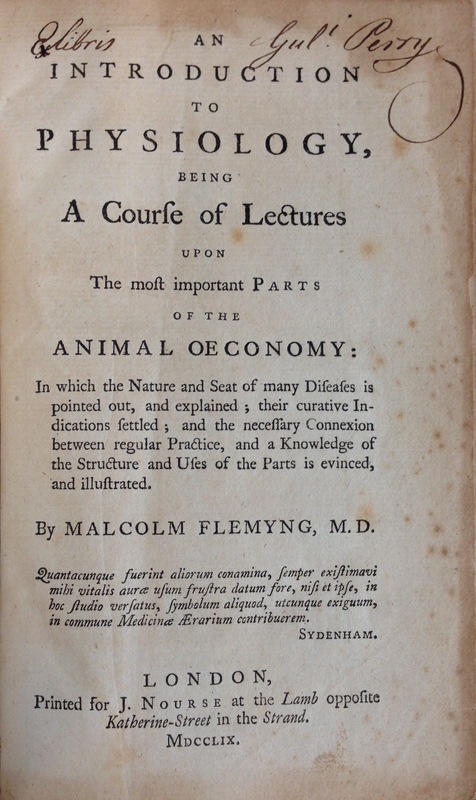 Such scarcity, when coupled with the book’s direct association with one of the most famed voyages of the eighteenth century, makes this copy of Flemyng’s Physiology one of the most important and treasured items held by Special Collections. According to W. E. Snell’s article ‘Captain Cook’s Surgeons’, Perry served as surgeon aboard four other ships before retiring in 1782 to his native Chiswick, where it is presumed he continued to practice medicine. He enjoyed a long life, dying in Hillingdon, Middlesex, at the age of 80 on 25 April 1827. 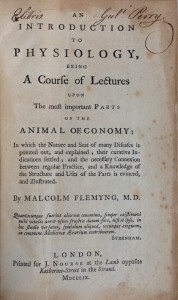 Perry’s copy of Flemyng’s Physiology was purchased by Special Collections from Hordern House in 2005 with funds from the Library Endowment Trust. It was previously in the collection of the American collector David Parsons. J. C. Beaglehole (ed.). The Journals of Captain James Cook on His Voyage of Discovery, 4 vols. in 5 (Cambridge: Published for the Hakluyt Society at the University Press, 1955–1974), 1:437. For more about some of the titles consulted by Cook, Banks and the artist Sydney Parkinson, see D. J. Carr’s ‘The Books That Sailed with the Endeavour’. Endeavour, new series, 7:4 (1983): 194–201. 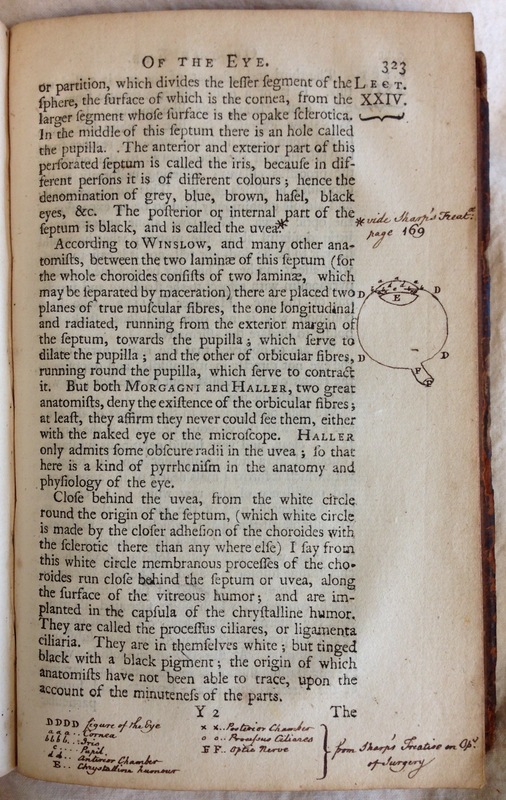 Perry’s copy of Flemyng’s Physiology was unknown to Carr and therefore went unaccounted. Banks’s books that travelled with him were incorporated into his personal library upon his return to England, and are held by the British Library. The Parsons Collection: Rare Pacific Voyage Books from the Collection of David Parsons; Part I: Dampier to Cook. (Sydney: Hordern House, 2005), no. 86. W. E. Snell. ‘Captain Cook’s Surgeons’. Medical History 7:1 (January 1963): 46–47. For more on the formation of Parsons’ collection, see his article ‘The Pleasures of Collecting Books on Cook and Pacific Exploration’, published in Cook’s Log 30:2 (2007): 7–9. Fantastic, what a piece of history! Thanks for the great read on a great Yorkshire man!